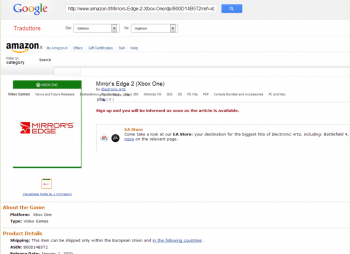 The page has since been pulled, but for a while there, if you happened to be trawling Amazon's Italian site, you could find a pageholder advert for Mirror's Edge 2. This supposed sequel to EA's first person parkour title recently hit the news cycle when Amazon Germany had it listed for Xbox 360 - at an eye-watering €99.99 ($130), mark you - but Italy's reveal lacks a price tag. However it does have something Germany's advert didn't; clear indication that the title is headed for Xbox One. Assuming, of course, that it exists at all, though at least one developer over in Stockholm claimed back in November 2012 that it's "general knowledge" DICE is working on Mirror's Edge 2. If true, it's likely that Mirror's Edge 2 will be one of the new games revealed at E3 later this year. This is the same title that, rumor had it, was cancelled by EA, and then uncancelled. Back in 2010, EA's Frank Gibeau claimed that the company had learned from its Mirror's Edge mistakes. "You have to spend more time on a game to ensure it's polished," he said, and now, several years later, we may get to see whether EA really did learn as much as Gibeau seemed to think it had. No, there's no release date for this title. What were you thinking? This is still very much in the not-confirmed bucket, for now.